Give Fluffy an alternative to shredding your favorite chair. Scratching is a natural activity that helps cats' shed the outer layers of their nails. As much as you love your furry feline friends, you don't want them damaging your furniture and walls with incessant clawing. Redirect them by providing fun toys of their own and reward their positive behavior. Confine very young cats to a small, closed-off area when you’re not around to keep an eye on them. Deck their room or alcove with climbing towers, toys and scratching posts. You can buy “cat condos” and other commercial products at pet supply stores, or you can make your own scratching post by covering wood with carpet remnants. Use a commercial anti-scratch spray on furniture and walls. These sprays have an odor the kitties don't care for. Test the spray in an inconspicuous area first to ensure it won't damage your furniture. Use positive reinforcement when Kitty plays with his own toys instead of yours. 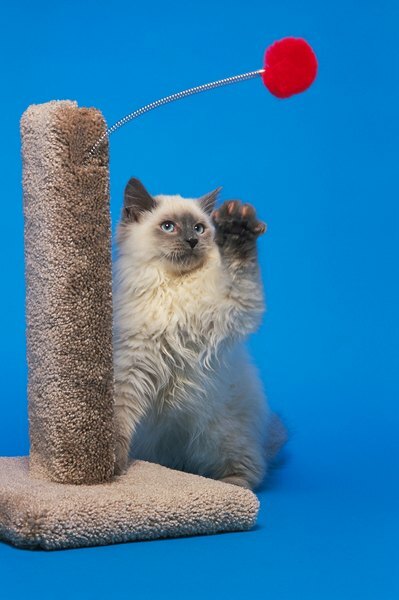 Place treats on top of scratching posts so your cat has to stretch and reach to get his goodies. Reward and praise your kitty every time he uses his post for scratching to reinforce the behavior. Let Kitty know that scratching on walls and furniture won't be tolerated by giving him a quick spritz of water from a plant sprayer when you catch him in the act. The cold shower will help your cat get the message that scratching the furniture is a no-no. He'll start to understand that when he scratches in the right place, he gets a treat, and when he scratches in the wrong place, he gets a shower. Make a loud sound every time Kitty goes wild on the wall or chair. Just like the water shower, he will start to associate the scary sound with scratching. Never force Kitty to use the scratching post by holding his feet and making a scratching motion. This will make him frustrated and unlikely to scratch where you want him to. Avoid buying used cat scratching posts at garage stores or thrift shops. They will smell like their previous owners, and the unfamiliar smell may create an elimination problem.